As part of my project to sew my winter coat, I’m finding it tricky to source suitable interlining and lining fabrics here in the UK without resorting to expensive overseas shipping prices. Following Kay Y’s experience with the 150gsm Thinsulate, I rang up Pennine Outdoor who stock it here in the UK and got their advice on suitable warm interlining fabrics. They stock a huge range of outdoor and sport fabrics, so I spoke to a lovely lady on the phone who helped me through my choices. She ultimately recommended microfleece as the best warm, lightweight, and draping choice for me, but conceded that it wasn’t windproof (but that using a silk twill lining would probably help the wind anyway). The only windproof fabric they stock is very bulky and doesn’t drape nicely, and when I enquired about Meraklon, she said that it was tubular and stretchy and also had a bad drape and that it was more suitable for linings of close-fitting garments. So my black microfleece arrived (along with a bunch of other fabrics I’ll show off later), and I’ve been doing some experiments to see how it behaves with my wool coating. 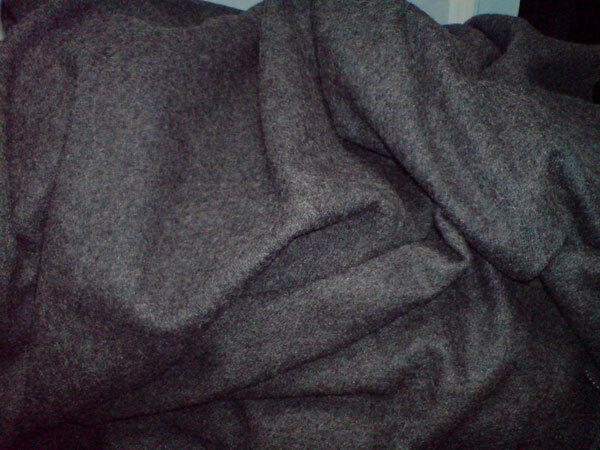 Holding the fabrics, one in each hand, the microfleece is clearly much, much lighter than the wool. I didn’t have time to dig out my hanging luggage scale, but I’d wager that the 3m of microfleece weighed less than half than the 3m of wool coating. 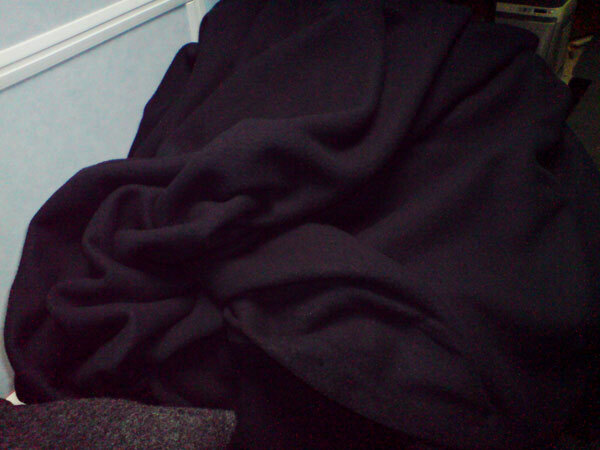 This is good, as I really want the microfleece to add warmth, but not much weight. I then tried blowing on the fabrics (good thing I was all alone, as I felt a bit silly!) to simulate the wind. With just one layer of the wool, I could clearly feel the “wind” on my hand through the coating, but if I layered the two fabrics together, I could only feel a slight movement of the fabrics on my hand, but not any of the “wind” itself. This is better than I was expecting, frankly, as I’d been told the microfleece isn’t windproof. And then onto the draping. Because the microfleece is pretty lightweight and thin, it actually drapes very well on its own (MUCH better than the regular fleece I’m used to working with). 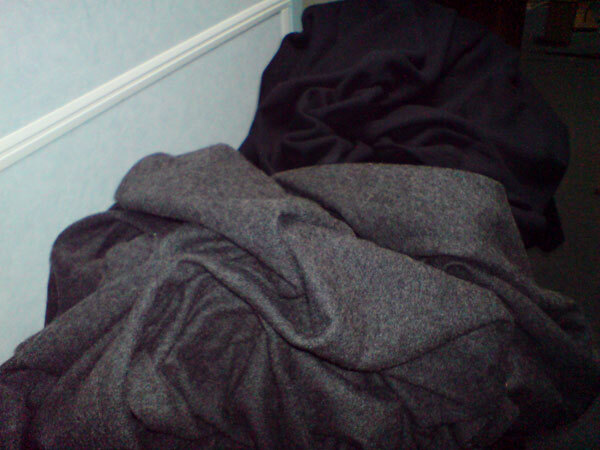 For a comparison, here’s the grey wool coating on its own next to the black microfleece on its own. To my eye, they seem to drape to about the same degree. I hung both over my dressform, but I was having problems getting the drape to show up nicely with my phone’s camera in there, but you can see the same effect here. Now there’s certainly some loss here with the two layers together, but it’s in no way stiff, and I think for the style coat I’ve chosen, this degree of drape certainly isn’t going to look awkward, especially considering all the warmth and wind-proofing I’m gaining by adding the microfleece as an interlining. So I’m counting this as a success, and the next step is to make my muslin for this coat and pre-shrink the fabrics (luckily Rosenberg’s ripped the wool so it’s already true to grain at the edges!). Separator image Posted in In Progress and tagged with coat, fleece, wool.